Many companies track the hours of their employees through a time-clock system, whereby staff members “punch-in” upon arrival, and “punch-out” at the end of the day. Did you know that it is extremely easy to combine this function in with your employee photo ID badges, which many companies use to verify the identities of employees both on-premises and off-premises? 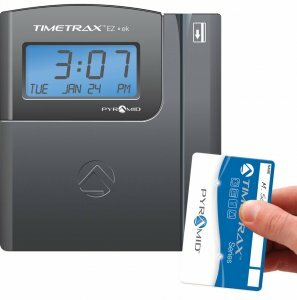 Most time clocks can be configured to read a range of different technologies: magstripe, RFID/prox, barcode, biometrics, etc. Any and all of these technologies are available on the photo ID cards which are ordered and printed on-demand from the InstantCard website. When setting up your unique custom template, which is always a free service by our professional graphic designers, just tell us which technology your time clocks use. We’ll then ensure that all employee badges produced in the future will be able to be read by your time clocks. Technology allowing long-distance reading is also available, so that organizations can track in real-time which staff members are working in different areas of the building by merely reading their ID badges as they enter and leave designated sectors. It is very common to use a single photo ID card to allow building access through the Prox feature, as well as for time tracking. The integration of ID badges and the time-clock function will make life simpler for your employees, avoiding the need for multiple cards and ensuring greater compliance with corporate HR policies.